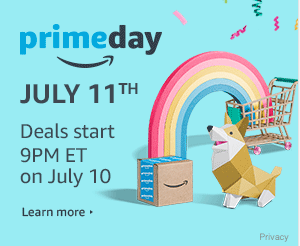 Amazon’s third annual Prime Day kicks off early, at 9PM EST on Monday, July 10th. The event gives us 30 hours to grab some of the best deals ever found online. Not an Amazon Prime member? You can sign up for a 30-day trial and take advantage of Prime Day offerings. Businesses and professionals will find thousands of useful and necessary items. Be sure to act fast, because some Prime Day offerings are in limited supply and go lightning fast. External hard drives for alternate storage and backing up computers. Desktop and portable ones will be offered at stellar pricing. Last year I got two high-quality, 3-TB portable drives for under $100. I use them for housing tens of thousands of photos and videos. Echo devices. I love the Amazon Echo, which we use primarily for music, lists, online ordering and reminders. Since Alexa can read you calendar events and reminders, it’s as useful in the office as it is in the home. You already get a wide range of music with Prime, but as part of Prime Day promotions, Amazon’s offering 4 months of Music Unlimited for just 99-cents. Fire tablets. I’m an iPad user, but I realize Apple products aren’t for everyone. A tablet, though, gives any professional a means to stay connected and get more done. If you’re looking for the most affordable means to monitor social media channels, organize lists and appointments and listen to audio books, Fire works just fine. Spare cables and chargers. Most of the device cables and chargers seen at the checkout in convenience stores aren’t certified and aren’t recommended for expensive smartphones and tablets. Stock up on a spare or two at an awesome price. SLR cameras. Need to take studio-quality shots? Do your research now and add your favorite digital SLR cameras to your Amazon Wish List so you’ll be notified if they go for a steal on Prime Day. Since Amazon has been tight lipped about exactly what deals will be offered, we can expect to see many that resemble last year’s offerings. If you’re not a Prime member, become one before 9PM on July 10th. Since some deals go very fast, you don’t want to waste any time signing up after the one you want launches. Install the Amazon app. This is key to getting instant notifications and grabbing the deals you want quickly. Browse-shop Amazon and add your most preferred items to a Wish List. You’ll get notifications if/when items on the list go up as a Prime Day deal. If you have an Echo, make sure it’s close by. There will be some Alexa Prime Day voice-only deals. Be prepared to place multiple orders. A Prime Day deal isn’t yours until you finalize checkout, so grabbing several may mean placing several orders in a single day. What are you hoping to grab for a steal on Prime Day?